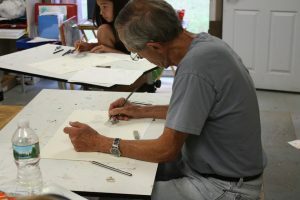 This adult drawing class near Mansfield MA begins by teaching the fundamentals of line, form and shape then introduces more complex concepts of composition texture and more. As skills develop students create finished art work as a means of introducing the more creative aspects of drawing. This is a great beginning point for all other disciplines.